Just been for a long lunch so not feeling very beautiful – in fact, feeling like an over-stuffed sausage so I’m going to answer some of your beauty questions (to the best of my abilities!). 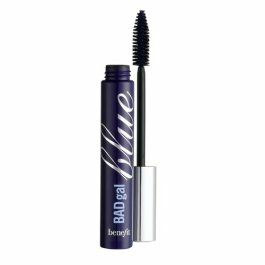 I’ve had a couple of queries about the Bad Gal Blue mascara from BeneFit. Now, I’m a big fan and I haven’t loved a coloured mascara since the ill-fated FCUK cosmetics range in Boots (loved Moonie, the greeny blue, sob for discontinuation). On its own, the effect is very strong – this really is an electric blue blue blue so not for the faint hearted. I wore it one day in New York on a bit of a whim and got some very funny looks up the Empire State Building – but then I like a funny look. For a more subtle look, I would use original Bad Gal or Get Bent and just tip your lashes with this baby. I do love it though, there’s something very retro and cool about it, plus there aren’t many good coloured mascaras out there and this is great quality. Another thing I’ve been asked about is hand cream. Now, I have a complete phobia of Madonna claws so I moisturise my hands religiously, whenever I moisturise my face, when I get into work, when I’m leaving work, whenever I wash my hands – you get the picture – so I’ve usually got a few tubes on the go. 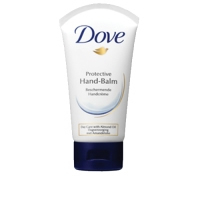 At the moment, I’ve got a tube of Dove Protective Hand-Balm at my desk which I love because it’s not greasy, it’s a lovely cream gel type formula and it sinks in right away, leaving your hands feeling refreshed. At home, I’m using Soap&Glory Hand Food which is really rich and creamy and perfect to put on at bedtime. And both are a complete steal at under £4 each! If you need something to use on the go, use the Dove. If you want something really rich, go Soap&Glory. You can find Bad Gal Blue at HQ Hair.com, Dove in all high street beauty retailers and supermarkets and Soap&Glory exclusively at Boots.